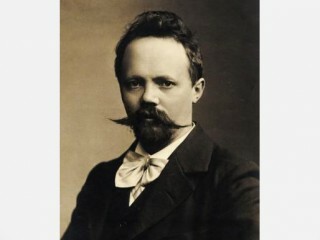 Engelbert Humperdinck (1 September 1854 – 27 September 1921) was a German composer, best known for his opera, Hänsel und Gretel. Humperdinck was born at Siegburg in the Rhine Province. After receiving piano lessons, Humperdinck produced his first composition at the age of seven. His first attempts at works for the stage were two Singspiele written when he was 13. His parents disapproved of his plans for a career in music and encouraged him to study architecture. Nevertheless, he began taking music classes under Ferdinand Hiller at the Cologne Conservatory in 1872. In 1876 he won a scholarship that enabled him to go to Munich, where he studied with Franz Lachner and later with Josef Rheinberger. In 1879 he won the first Mendelssohn Award given by the Mendelssohn Stiftung (foundation) in Berlin. He went to Italy and became acquainted with Richard Wagner in Naples. Wagner invited him to join him in Bayreuth and during 1880 and 1881 Humperdinck assisted in the production of Parsifal. He also served as music tutor to the composer's son, Siegfried. After winning another prize, he traveled through Italy, France, and Spain and spent two years teaching at the Gran Teatre del Liceu Conservatory in Barcelona. In 1887 he returned to Cologne. He was appointed professor at the Hoch Conservatory in Frankfurt am Main in 1890 and also teacher of harmony at Julius Stockhausen's Vocal School. By this time he had composed several works for chorus and a Humoreske for orchestra, which enjoyed a vogue in Germany. His reputation rests chiefly on his opera Hänsel und Gretel, which he began work on in Frankfurt in 1890. He first composed four songs to accompany a puppet show his nieces were giving at home. Then, using a libretto by his sister Adelheid Wette rather loosely based on the version of the fairy tale by the Brothers Grimm, he composed a Singspiel of 16 songs with piano accompaniment and connecting dialogue. By January 1891 he had begun working on a complete orchestration. The opera premiered in Weimar on December 23, 1893, under the baton of Richard Strauss, who called it "a masterpiece of the highest quality... all of it original, new, and so authentically German." With its highly original synthesis of Wagnerian techniques and traditional German folk songs, Hänsel und Gretel was an instant and overwhelming success. Hänsel und Gretel has always been Humperdinck's most popular work. In 1923 the Royal Opera House (London) chose it for their first complete radio opera broadcast. Eight years later it was the first opera transmitted live from the Metropolitan Opera (New York). It remains a worldwide favorite. While composing many works, Humperdinck held various teaching positions of distinction and collaborated in the theater, providing incidental music for a number of Max Reinhardt's productions in Berlin, for example, for Shakespeare's The Merchant of Venice in 1905. Though recognized as a disciple of Wagner rather than an innovator, he was nevertheless the first composer to use Sprechgesang —a vocal technique halfway between singing and speaking used later by Arnold Schoenberg— in his melodrama Die Königskinder (1897). In 1914 Humperdinck seems to have applied for the post of director of the Sydney Conservatorium of Music in Australia, but with the outbreak of World War I it became unthinkable for a German to hold that position, and the job went instead to Belgium's Henri Verbrugghen. On January 5, 1912, Humperdinck suffered a severe stroke. Though he recovered, his left hand remained permanently paralyzed. He continued to compose, completing Gaudeamus with the help of his son, Wolfram in 1918. On September 26, 1921, Humperdinck attended a performance of Carl Maria von Weber's Der Freischütz in Neustrelitz, Wolfram's first effort as a stage director. He suffered a heart attack during the performance and died the next day from a second heart attack. The Berlin State Opera performed Hänsel und Gretel in his memory a few weeks later. View the full website biography of Engelbert Humperdinck.